Route 25 has run between Ilford and Oxford Circus for the last 25 years, and has connected these two locations since the 1950s. 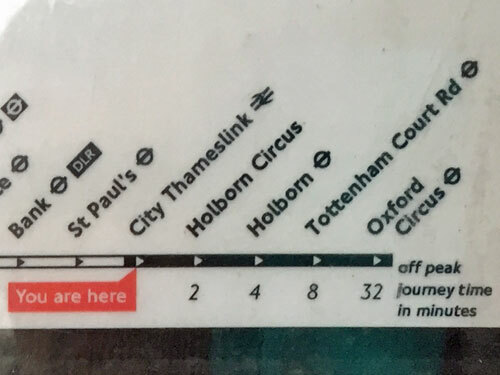 But tomorrow that long-standing connection is being broken, as the western terminus is permanently cut back from Oxford Circus to Holborn Circus. It's a peculiar decision - in part rational, in part insane - and not especially well thought through. The curious purge of London's busiest bus route continues. From Saturday 1 December 2018 route 25 is changing and will run from Ilford to Holborn Circus (City Thameslink Station). Oxford Circus, Oxford Street, Tottenham Court Road station and Holborn station will no longer be served. Routes 8, 98 and 55 can be used as alternatives to continue your journey. There will be no changes to the 25 night service but this will be re-numbered N25. 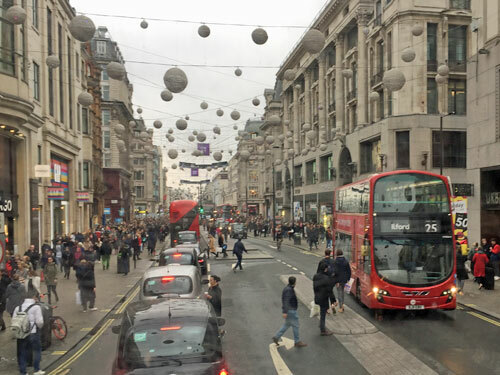 At the start of the year two enormous changes were scheduled for December 2018 - the opening of Crossrail and the pedestrianisation of Oxford Street. Had pedestrianisation gone ahead a cut to route 25 would have been forced, no questions asked, with Crossrail as useful mitigation. 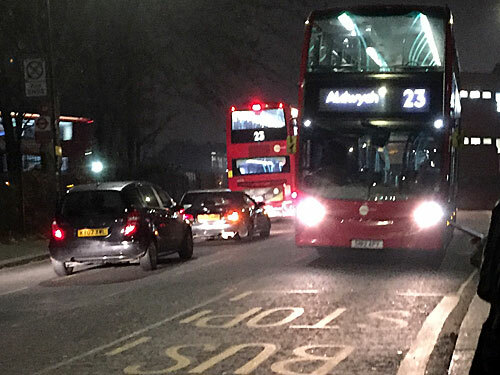 Indeed this particular cut to route 25 was part of a Crossrail-related consultation launched last year, alongside dozens of other routes, which has helped to bury public dissatisfaction. But even though neither of the enormous changes is taking place this December, the chop to route 25 is happening anyway. This graphic from the current timetable at the route's new terminus hints at a big clue why. Traffic. Route 25 is not a fast route. Its full 11 miles can take up to two and a quarter hours to complete, according to the timetable, with the last stretch towards Oxford Circus the slowest crawl. It wasn't quite as bad as 32 minutes when I tried it in midweek - my bus only took 28 - but traffic lights, traffic jams and building works all took their toll. By chopping off the last 1¾ miles of the journey TfL can save an hour of turnaround time, and thereby a lot of money. Today route 25 is operated by a fleet of 40 vehicles. From tomorrow it'll be just 32. Another reason for cutting back is that the vehicles currently operating route 25 aren't compatible with the Ultra Low Emission Zone being introduced next April. Cleaner buses are on their way, but obviously it's cheaper to replace 32 buses than 40. Indeed three months ago route 25 was operated by 60 vehicles, so to be able to halve the fleet is a big financial win. But passengers won't be keen on terminating early at Holborn Circus, so why the hurry? Here's TfL's consultation response giving the official reason why they're ploughing ahead regardless. There has been a big decrease in demand on route 25 over the last five years, particularly at the western end of the route. Demand is expected to fall further once the Elizabeth line opens. Continuing to run the 25 via its current routeing cannot therefore be justified. Following the changes, passengers will be able to use route 8 to continue their journey into the West End. The big decrease in demand at the western end of route 25 follows the halving of the route's frequency, which is hardly an external factor. If demand is supposed to fall further when Crossrail opens, making the cut a year in advance looks wilfully premature. And as for that excuse about being able to use route 8, well, that's where the impracticality of this change really kicks in, because route 8 doesn't go to Oxford Circus either. The 25's new terminus is on the right hand side of the map at City Thameslink. The withdrawn section, west towards Oxford Circus, is shown by red circles. And if you follow the path through, you'll see there isn't a single bus route which matches where the 25 used to go. Three routes continue across Holborn Viaduct - the 8, 46 and 521. The 46 turns off at Chancery Lane, so isn't helpful. The 521 runs as far as Holborn station, particularly at peak times, but not at weekends. So you want the 8, the 8's the way to go, at least as far as Tottenham Court Road. But then you have to change again, onto one of Oxford Street's four remaining bus routes, to get to Oxford Circus. These two changes add two extra waits to your journey, which could be fifteen minutes if you're unlucky, and may also add an extra fare. There is no simple alternative once the 25 is gone. Here's the illustrative map provided on the TfL website to explain to passengers what's going on. I don't think this map is as helpful as it could be. It combines the current situation, the future situation and the night-time situation, so is a complex amalgamation of three different states. Showing the deleted section of the 25 in grey is confusing. Including the unchanged overnight version of the route is confusing too, and those Night Tube owls are a wholly unnecessary flourish. So here's my simplified version. Let's use this to run through how a bus passenger from Ilford is supposed to get to Oxford Circus from tomorrow. First you ride the 25 into central London as before. Somewhere between Bank and City Thameslink you switch onto route 8. There are four possible stops at which to change over - Poultry, Bread Street, St Paul's Station and City Thameslink. TfL's map seems to recommend changing at City Thameslink via a 50m walk, which would be stupid when a walk is unnecessary. Separate instructions on the TfL website instead suggest changing at St Paul's station, where both routes serve the same stop, and that's much more sensible advice. Do that. Once you're aboard the 8 it'll take you to Holborn station and on to Tottenham Court Road. But, and here's the really senseless thing, there isn't a single bus stop where you can change onto the final route to Oxford Circus. Every possible option - and I've tried them - requires a walk of at least two minutes. Here's how. » Change at Holborn station (bus stop K): Requires a two minute walk up Procter Street to Red Lion Square (stop J), the first stop on route 98. » Change at High Holborn (bus stop Q): Requires a two minute walk to New Oxford Street (bus stop R), the second stop on route 98. 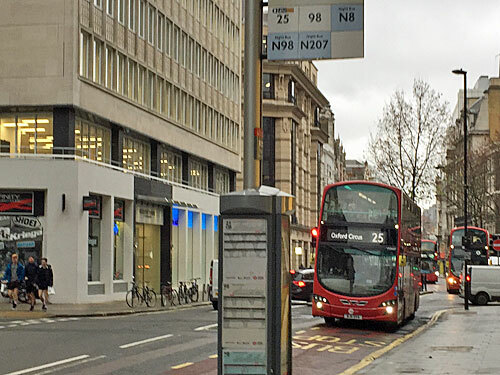 » Change at St Giles High Street (the last stop on route 8): Requires a 2½ minute walk towards Tottenham Court Road station (bus stop X) on New Oxford Street, which is served by routes 55, 73, 98 and 390. The last walk is the longest, but also offers a choice of four further routes rather than just one. The last option is also TfL's preferred recommendation. But all of the connections involve crossing roads, none is straightforward, and all are worse than the status quo. Another serious issue is that by the time you reach this point, your Hopper fare may have run out. Today you can get from the heart of Newham to Oxford Circus for £1.50. Tomorrow your 60 minutes is likely to be up before you reach Bank, as a quick check of the new timetable confirms. Even with the 70 minute window the Hopper actually provides, having to wait for a second bus increases the chance it'll have expired, and having to wait for a third bus almost guarantees it. There is a reason why so many East Enders ride the 25 and that's because it's cheap. The train fare from east of Stratford to zone 1 is £2.80 off-peak and over £3 at peak times, too much for many weekly budgets to sustain. By contrast, travelling east from Oxford Circus once the 25 is withdrawn is considerably easier. You catch the 98 from Oxford Circus. At Tottenham Court Road or Museum Street you change from the 98 onto the 8 at the same stop. Your Hopper fare cannot have expired. At Holborn Circus you change from the 8 onto the 25 at the same stop. Your Hopper fare cannot have expired. And then you carry on home for a total of £1.50. You will have wasted time waiting for two extra buses, but at least it won't have cost you any extra. Buses on route 25 have often turned short at Holborn Circus, that's nothing new. But from tomorrow they all will, and passengers being turfed off earlier than they expected may not be happy. They may also be poorer. They may also choose not to make the journey because it'd cost too much, or be too much hassle with a pushchair or in a wheelchair. The 25's withdrawal isn't about making passengers' lives easier, it's about saving TfL money... and an obsession with removing buses from Oxford Street. London's busiest bus route, today the only link from the heart of the City to the heart of the West End, will tomorrow be terminating two miles from Oxford Circus - nowhere useful - without a decent alternative connection to take its place. What were they thinking? Thu 1: I'm struggling with the new BBC Sounds app, and I haven't even downloaded it yet. Its hip'n'happening yoof categorisation is not the way I approach my listening needs. Thankfully they haven't disabled the old BBC Radio Player app yet, so I'm sticking with that. Fri 2: Two 4-hour bus journeys are ideal for reading a decent proportion of a 1000-page short story anthology, although the downside is having to lug the heavy volume up Box Hill. And how exciting to discover (on page 183) the short story one of my favourite films was based on. 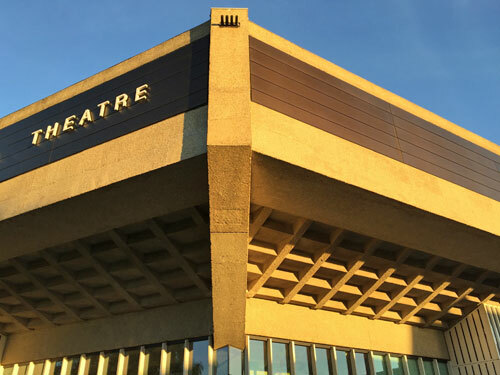 Sat 3: When visiting the lobby of an iconic concrete building, what you don't want to hear is a sour-faced volunteer saying "Oh I don't think you can take photos in here". Much better to say "I'll just check whether you're allowed to take photos in here," especially when the answer to that question turns out be "Yes". Sun 4: Some days you get the instant gravy consistency absolutely spot on. Today was such a day. Mon 5: The winner of the last ever series of Big Brother is someone my Dad knows. These are not words I ever expected to type. Wed 7: The Democrats taking the House while the Republicans keep the Senate is at least one step back from the global doom-cliff the world has been edging inexorably towards recently. Thu 8: Seriously? That is unbelievable. Well done! Fingers crossed for you both (and thanks for the baked beans). Fri 9: The leaves are so beautifully orangey yellow at the moment, and by the end of next week they absolutely won't be, and how quickly the autumn turns. 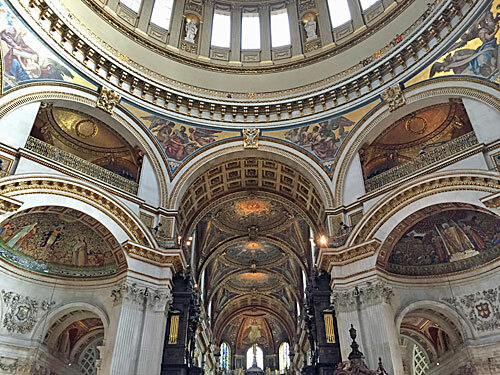 Sat 10: Once a year, on the day of the Lord Mayor's Show, St Paul's Cathedral is open to the public for free. I'd forgotten quite how magnificent it is inside, how many utterly famous Britons are buried within, how many steps there are up to the Whispering Gallery, and how jarring it is to find a cafe in the crypt on the way out. Saved me £18 too. Sun 11: I was woken up by a massive bang at twenty to seven, which rumbled on for several seconds somewhere in the distance, and I have never heard anything quite like it. My first assumption was that a bomb must have gone off somewhere, because it was that loud (and because of the date), so I did the modern thing and checked Twitter. I spotted that only people in Bow and Stratford had heard it, and it turned out to be a single lightning strike by the Bow Roundabout, so I went back to bed. Mon 12: All the post-2005 episodes of Doctor Who are available on the BBC iPlayer, all 152 of them, so watching a couple of Russell T Davies belters is an excellent way of filling a grey afternoon. Tue 13: I happened to be passing the church where my parents got married, and normally the doors are locked but on this occasion they were open, so I went and had a look inside for possibly the first time ever. It was bigger than I was expecting, and just a tad emotional. Wed 14: I haven't been out for beers with the blokes from work for months, so it was nice to meet up, even if the chosen location didn't sell anything I particularly wanted to drink. Impressively it took over an hour for the conversation to turn to that dull subject the conversation always turns to. Thu 15: The sheer relief, when the Prime Minister has scheduled a press conference inside No 10 at 5pm, to discover that she's not initiating anything new, just restating something everyone's already heard. Fri 16: The Calor Gas centre by the Bow Roundabout has finally closed down. In January it sold for £31m, along with the Ideal Furniture warehouses nextdoor, and will be reborn as Bow River Village Phase 3 in 2021. How long before the entire riverside is flats flats flats? Sat 17: The Tilbury Ferry has a 65 minute gap in the afternoon when it doesn't run, and by unintentionally turning up near the start of that gap I had to cancel my quick jaunt to Gravesend. Probably for the best. Sun 18: Hell yes, I have completed the prize crossword in yesterday's newspaper. I guess it can't have been that difficult this week. 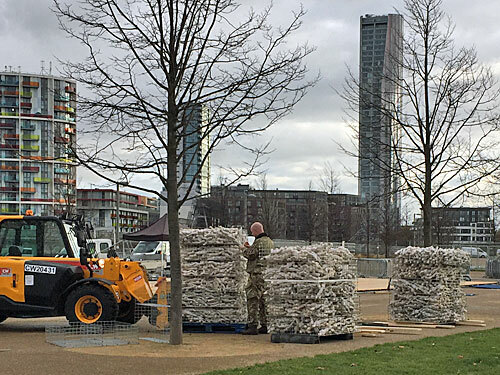 Mon 19: The army are packing away the Shrouds of the Somme into boxes, and JCB-ing them into the back of a big lorry. Tue 20: I'd forgotten how much I liked sliced beetroot. Wed 21: A fun strategic game is to cross Hackney Marshes, zigzagging across the football pitches, keeping as far away as possible from the hordes of dogwalkers exercising ten hounds each. Maximum points. Thu 22: I spotted National Rail's New Measurement Train surveying the tracks outside Kentish Town station and, because I was in company, didn't attempt to take a photo and upload it to social media crowing that I'd seen the 'Flying banana'. I am not a proper trainspotter. Fri 23: But I am the kind of person who tots up his grocery total on the way round the supermarket... so when the new cashier overcharged me, twice, I noticed and got the extra £2.05 refunded. Sat 24: The new station at Barking Riverside now 'exists' as a raised embankment of earth, though still in the middle of a bleak estuarine landscape of landfill and pylons, and it's amazing how much they intend to charge for flats out here. 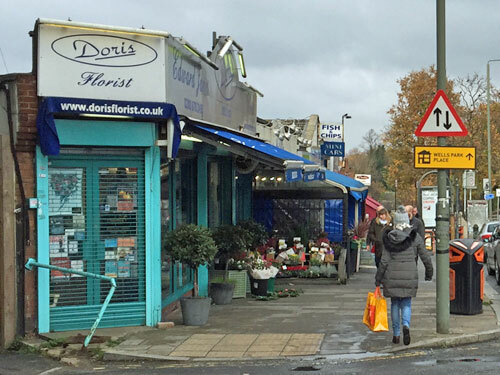 Sun 25: The owner of the hardware shop on Westow Hill in Upper Norwood has placed a handwritten sign on the pavement saying "Wheelie bin numbers sold here", and I wondered how much of a local necessity they must be for such an advert to be a moneyspinner. Mon 26: That is my second highest-ever score at Threes. I assume some of you somewhere are still playing Threes. Tue 27: You know what, there's a dead CD player in my spare room, of relatively mammoth size, and that might as well go down the tip too. 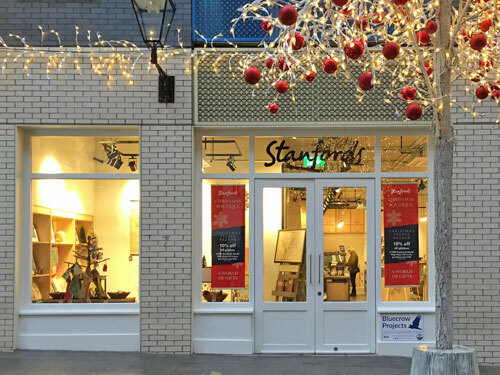 Wed 28: The new Stanfords opened today in Covent Garden, initially as a Christmas boutique, but in January the entire map shop shifts over. 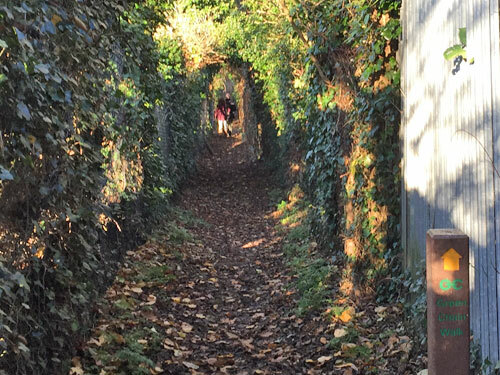 It's only a couple of minutes walk away, but so well concealed you're unlikely to stumble upon it by mistake. Initial impression - full of unnecessary gift items and a bit small (although there is additional floorspace upstairs and in the basement that's not yet open). Thu 29: I probably ought to eat my last half dozen Creme Eggs before next year's are released. Getting out into the environment is ace, and good for your health. But how do you persuade people to do more of it? 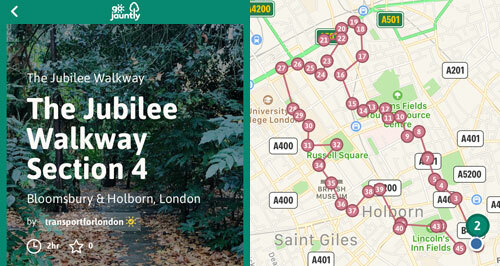 One app that's keen to get us outdoors, with TfL's backing, is Go Jauntly. They have what is clearly one of the worst brand names ever committed to a digital platform, a twee brainstormed phrase which someone important inexplicably took seriously. They also describe themselves as "a platform to help people discover walks, curate their own and share outdoor adventures", and I don't know about you but whenever I hear the word 'curate' outside the context of a museum I always lose faith in whoever said it. Indeed the app's ghastly bonhomie long dissuaded me from downloading it, even after it won the Mayor and TfL's Civic Innovation Challenge for Active Travel 2018, that and the subscription fee. But yesterday I thought I'd give Go Jauntly a try, reassured by the fact that subscription was optional, and then I let it take me for a walk. As part of the app's onboarding process I was invited to become part of "the Go Jauntly community". Join with Facebook, they said, or Join with Email. Stuff that, I said, having spotted the "I'll join later" option underneath, and being certain that I never would. Would you like to share your location, they asked, and I said no because I always say no until I've found out why. Then they asked if they could send me notifications, and I refused for similar reasons. And then I was inside the app, and looking for inspiration. There are two ways to hunt for inspiration - locally, and by category. Categories include Latest added walks, Kid friendly wanders, Walks on your doorstep, Perfect lunchtime jaunts and The best walks around. To access the best walks around costs £1.99 a month, so by inference us freeloaders are only seeing the less good ones. The walks on your doorstep most likely aren't anywhere near. The perfect lunchtime jaunts are only perfect if you work in the right place. To find anything useful, searching by location is the only way to go. If you type in a place, the app will list nearby walks starting with the closest. 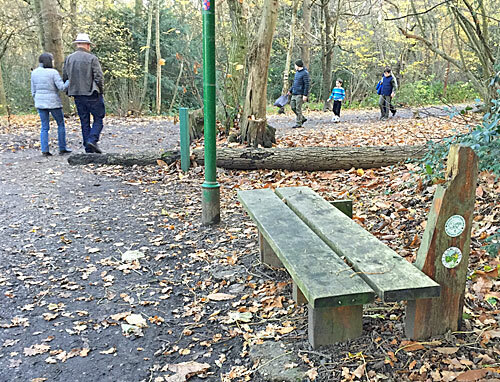 Typing in Bow brings up over 200 walks within 20 miles, the closest in Victoria Park and the furthest in St Albans. Typing in Manchester brings up 24 walks, and Plymouth 16, but Edinburgh only manages 7, Cardiff 3 and Hull 1. The app has ambitions to be national but is somewhat reliant on its contributors, and so far London has by far the lion's share. With such a local onslaught it proved much easier to search on the map, for which you have to share your location, which eventually I did. Every 'jaunt' package comes with a summary front page including the author's name, a suggested duration, a number of likes and a row of symbols confirming for example whether the walk is dog or child-friendly. If you choose to embark on your walk based solely on this front page, good luck to you. Some authors 'curate' better walks than others, and that suggested time is very possibly wildly inaccurate. I've found one jaunt in Shoreditch which states "2 hours 22 minutes" but in reality is only 500m long, the remainder of the time supposedly spent wandering around a city farm admiring sheep and donkeys. Once you've picked your walk, the app's killer feature is that it provides step-by-step screen-by-screen instructions with photos. Not only will you be told how to follow the trail ahead but you'll see photos confirming that you're in the right place. Walks can be 6 screens long or 60. Brilliantly there's also the option to switch to a map as necessary, with your location shown as a blue blob to assist with orientation. For a generation brought up on GPS and satnav, it's potentially ideal. The other dead clever feature is that users can contribute their own walks. Go for a stroll, take some photos and the app uses GPS to compile your favourites into a waymarked trail, described using your own text for navigation. Alas it's soon clear that different people contribute very different kinds of walk. Some are decent hikes, others short meanders with opportunities for social interaction and many won't be to your taste at all. I found rather too many like Kimberley's sketched dawdle through Camden Market, starting with "Meet you friends in the Doppio Coffee warehouse" and ending with "Enjoy the picnic on the top of the hill". So to test out the app properly I turned to a familiar author - TfL. As custodians of London's strategic walking network they've contributed 20 jaunts to the app, including every stage of the Capital Ring and the five loops of the Jubilee Walkway. I know the Capital Ring too well, but the Jubilee Walkway is a proper challenge, being a twisty route round central London with insufficient waymarkers to follow on the ground. Also it's a good choice for a grey day in November because none of it is muddy. I called up Jubilee Walkway 4 on the app, made my way to the official plaque partway along Chancery Lane and set off. I knew I was heading on a loop round Bloomsbury and Holborn but not precisely where, because I was trying to rely solely on 45 screens of step-by-step description to get me round. It worked really well. The instructions were clear, each turn clearly signalled, and the photos really did help confirm I was going the right way. Yes that's Bedford Row on the right, yes that tree in Brunswick Square Gardens looks just like the one in the photo, and yes that's the zebra crossing into Woburn Square. I had to hunt carefully to find a couple of street names on the sides of buildings, but I didn't need the map once and the whole thing was very well thought through. Plus it's a fascinating walk. I got to enjoy Bloomsbury's splendid Georgian terraces and crescents. I got to see the Christmas decorations in the Brunswick Centre. I got to admire St Pancras from the Euston Road. Best of all the route actually passes through the British Museum, and the new security queues aren't that bad on a Tuesday. This walk has numerous intriguing places to potentially linger, including Lambs Conduit Street, the British Library and Lincoln's Inn Fields, but on this occasion I kept on walking. That means I can confirm that "2 hours" is pretty much spot on for how long this walk takes, confirming that TfL compiled this route with care. In conclusion, the name's awful, the selection's London-centric, the suggested timings are wildly subjective and the walks are of variable quality. At their best, the on-screen directions with photos are an excellent way to navigate, definitely better than trying to scroll around a pdf on a tiny screen. Allowing the public to upload their own jaunts helps provide a wide base of options, some ideal if you have a family to entertain, others great if you want to connect coffee shops, but serious walkers may not be impressed. My recommendation is to stick to the walks written by experts. I can generate my own inspiration for a walk, thanks, so I won't be paying for a Go Jauntly subscription, nor indeed following its other offerings. But you might think the app's worth investigating, and if it gets you out of the house then it'll have achieved its aim. On Friday evening my microwave died. I was heating up a potato when I saw sparks on the other side of the internal gauze, so I turned off the oven and unplugged it and resigned myself to buying a new one. When your magnetron's broken, all is not well. Then I rejoiced, because if there's one good day of the year for your microwave to break, it's Black Friday. This American retail interloper has gained traction in the UK over the last few years, filling inboxes with spam and enticing folk to buy so-called bargains they don't need. But if you do suddenly need white goods, and fast, it's a godsend. I had a new microwave in my kitchen before 10am on Saturday morning. None of this poncing around with delivery options for me, I got the bus into Stratford, paid much less than normal in Argos, then caught the bus back. Microwaves are quite manageable on buses so long as you catch a quiet one, and are physically capable of waving your Oyster card against the reader while holding the box. But this left me with a dead microwave. Rather than it clogging up the house I thought I'd best get rid of it, so considered my options. I could have dropped it in our communal bin, but I suspect the refuse collectors (and the management company) would have complained. I could have left it out on the pavement assuming a passer-by would take it away, except that's littering, and I knew the microwave was unsafe. I could have rung up the council to come and collect it, but they'll only turn up twice a year, and that seemed like a waste. So I decided to take it to the tip. My past experience of 'going to the tip' is from years ago, and involved getting into the family car with some unwanted artefacts and driving into the countryside. Council tips tend to be a long way from residential areas, which is fine when you have a car and less good when you don't. Also large chuckable items tend to be heavy, which again is fine when you have a car and less good when you don't. Visiting the tip isn't always easy. If I lived in Redbridge, the council tip would be up a sideroad between a river and the M11. If I lived in Newham, the council tip would be off the A13 almost in Barking. If I lived in Hillingdon, the council tip would be at the miserable end of New Year's Green, which is somewhere I'm keen never to visit again. If I lived in Sutton, I wouldn't be allowed inside the council tip without a permit obtained by showing two forms of ID. If I lived in Hackney, there wouldn't be a council tip, only permission to visit some of the neighbours'. How would Tower Hamlets fare? Tower Hamlets' tip is on the Isle of Dogs. Specifically it's on the eastern side, alongside the Thames, roughly level with Canary Wharf. For someone living on my side of the borough it isn't too hard to get to. I worked out it was doable in two buses, or via the DLR and a long walk, so took the two-bus option. I managed to rest the microwave on the driver's cab while touching in, and nobody seemed to mind that was I filling up a seat with a big cardboard box. Finding the tip in Yabsley Street was easy - I followed my nose. I wonder if residents of the adjacent highrise developments realised this before they moved in, and now have to keep their windows closed more often than they expected. All the local dustcarts empty into one half of the site, which is privately run, and conveniently located because refuse can be taken away by boat. 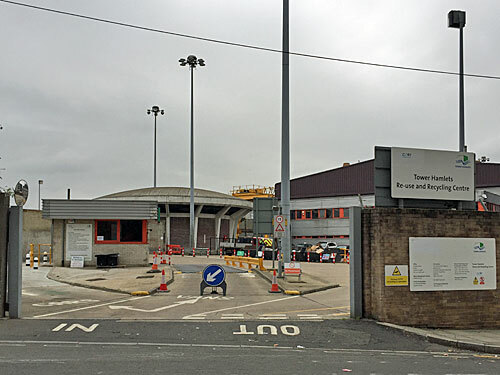 Tower Hamlets council now only own the pull-in yard in front of the Blackwall Tunnel ventilation mushroom. 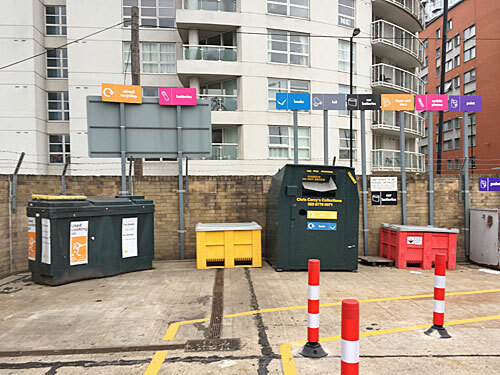 It's also no longer a 'tip', it's a Reuse and Recycling Centre, the emphasis now on sorting rubbish by category rather than dumping it all into a single skip. I looked a bit lost, so a man in a woolly hat directed me to follow the pedestrian walkway to a shed at the back, passing several bins and receptacles along the way. Lights flashed. A sign warned that children and animals must stay in their vehicles. I manoeuvred between the cones. The shed at the back is used to store expired electricals, including several lines of white goods and three cages of smaller stuff. 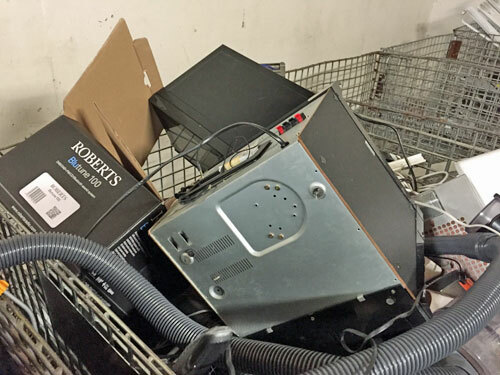 Toasters, vacuum cleaners and hi-fis were amongst the goodies piled up - once the latest must-have gadgets, now dirty, defunct and unwanted. I managed to find space for an empty black metal cabinet and bade my old microwave farewell. Its cardboard box went into a separate skip outside, and then I got the bus home. That was a much easier journey. And then I went back again. I had another microwave I hadn't thrown away when I should have done, a grey one which went wrong in 2016 and which I replaced with the black one I'd just chucked. It would have been a good idea to get rid of it at the time but I didn't, for the same reasons listed above, so it was stashed away taking up floorspace. Using my newly-gathered tip-visiting intelligence I now knew how to get rid of it, so I did. I was expecting the bloke at the tip to be suspicious. I'd been down with a microwave in a box an hour earlier, and here I was with a microwave in a box again. Thankfully the bloke on shift was different now and waved me through, and my old dead microwave joined my new dead microwave in the cage in the shed. Also fortunately, Tower Hamlets don't seem to ask to see ID to confirm you're a genuine resident, so nobody was checking up on the frequency of my microwave-dumping visits. What I only noticed on the way out on my second visit were special bins for items I don't normally see special bins for. Tinfoil. Mobile phones. Books. Cassette tapes. Discs. I have a lot of the last three, probably rather more than I need, and now a means of thinning them out. I don't really want to get rid of them, but I'm going to have to one day, or else someone else will have to get rid of them on my behalf. Looking around my flat, your house, wherever, pretty much everything in it will end up down the tip one day, it's just a case of how long it takes. 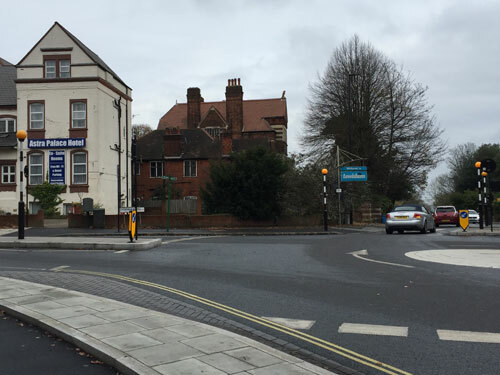 The Vicar's Oak 'stump' is in Bromley, but to keep this walk as short as possible we need to start on the southeastern corner of the crossroads (which is in Bromley too). 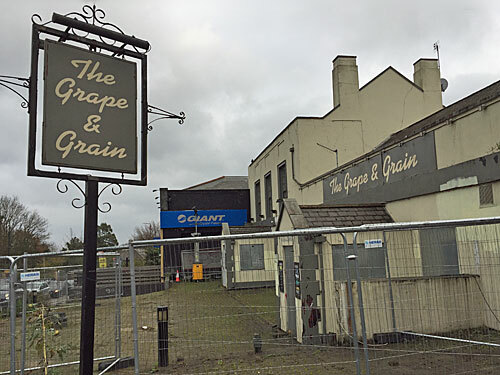 Here we find The Grape & Grain pub, which closed last year and is currently boarded up and fenced off awaiting redevelopment as a three-storey Wetherspoons. Previously on this site was the Royal Crystal Palace Hotel, well-frequented by Victorian tourists (including Emile Zola and Emperor Frederick of Germany), but irreparably damaged in the war. The clock starts on our walk the moment the pedestrian crossing lights turn green and the streaming traffic briefly pauses. Here we are on one of the pointy corners of the Norwood Triangle, so narrow that the only building which fitted was another pub. Or former pub, because The Cambridge closed down in the summer of 2011 and has been vacant ever since. The pub had a pretty poor reputation inside, but boasts some splendid floral glazed tiles outside, as befits its late Victorian heritage. Alas there's no time to admire them closely, or look in on the dentist nextdoor, because it's imperative to get across the next road before the lights change. Our third borough is Lambeth, which somehow stretches from Waterloo Bridge to this suburban outpost. 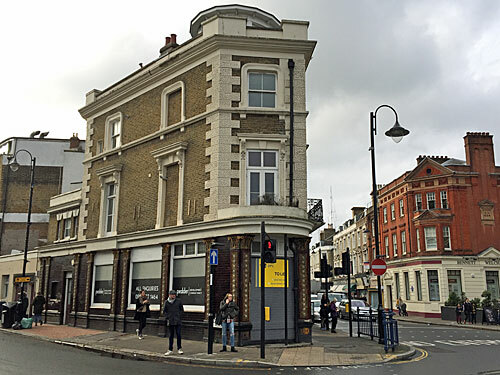 The pub on the corner, if you're not yet thoroughly tired of hearing about pubs, is Westow House, formerly The White Swan. Currently concealed behind a cage of scaffolding, a huge dangling banner is required to convince potential drinkers it is still open. The estate agents nextdoor has a blue plaque confirming that the painter Camille Pissaro once lived here for several months, taking refuge from the Franco-Prussian war, but we're not going that way. Instead a single parade of single-storey shops is all that our sojourn in Lambeth provides. I am always impressed by Doris Florist, if only for the name, and the blooms arrayed out front always look splendid too. Cafe St Germain exudes an alfresco dining vibe, even in grim November. Palace News and Royal Fish and Chips have rather more traditional offers. Keen Group minicabs and the Kish Mish Persian cafe are both squeezed into number 13. Niazi Food and Wine sells food from England, Asia, Africa, the Caribbean and Lithuania. Cafe Paradou majors in baguettes, paninis and ciabattas. The public conveniences underneath the pavement have been converted into a most unusual flat. And that's about all there is in Lambeth, passed in one minute flat. Three London boroughs in close proximity is nothing special, but four is unique. Seventy seconds after leaving Bromley we're in borough number four, because Southwark somehow stretches as far south as does Lambeth. We'll be in Southwark for the next eight minutes as we make a break for borough number five. This end of Crystal Palace Parade is all about the bus station, the Southwark side kicking off with the stop where terminating vehicles turf out their passengers, plus a grim-looking cabin where a supervisor might sit. Peer over the brick parapet to your left to see the site of the former Crystal Palace High Level station, now a somewhat atypical housing estate. What you won't see is the amazing Crystal Palace Subway, only the steps down, but know that something amazing lies under your feet. 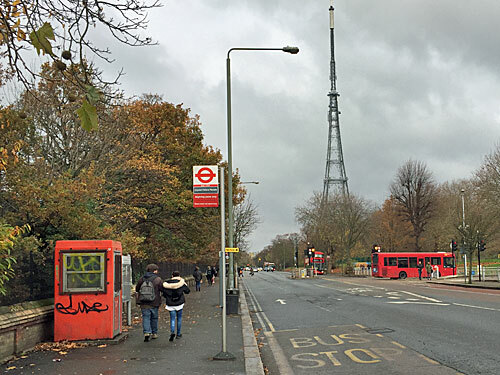 What utterly dominates this walk is the Crystal Palace transmitter, all 219m of it, just across the other side of the road in Bromley. It's been here since the 1950s, serving more viewers than any other UK TV mast, and you don't normally see it up quite this close. The mast rises up opposite the end of College Road, which you might be waiting to cross for some time if the lights are against you. On the other side is a Shell garage, should you fancy a hazelnut praline latte, then some rather ordinary flats, then a recent amalgam of segregated cycle lanes, mini-roundabouts and zebra crossings. Some borough's roadworks team has been exceptionally busy here. Stop the clock. A giant blue sign announces entry into the borough of Lewisham (as does a blue litter bin placed just beyond). Check the small print and it turns out the entire borough is a Designated Drinking Control Zone, which means you can now be fined up to £500 if you refuse to stop quaffing on request. The dominant building on this street corner is the Astra Palace Hotel, a converted villa with en-suite rooms and unsurprisingly downbeat online reviews. Intriguingly the precise boundary point here is on the other side of the road, near the driveway to the Caravan Club, where a historic parish marker post is embedded in the verge. 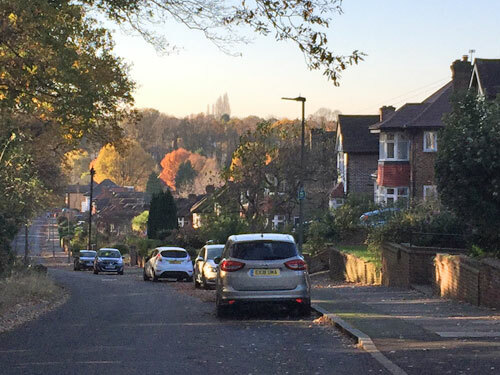 If we'd stayed on the eastern side of Crystal Palace Parade we could have walked all the way from the start point within just one borough - Bromley - but instead we've just visited five in under ten minutes. A unique achievement. 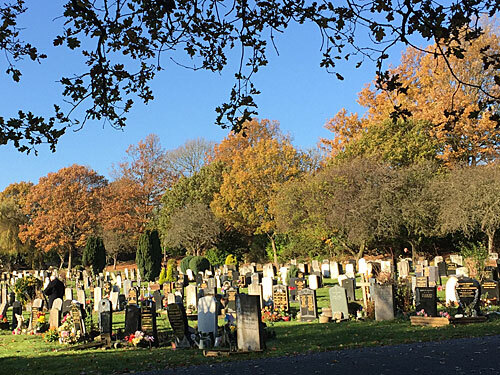 5: By walking through Willesden Junction station, then down the Harrow Road beside Kensal Green Cemetery, you can pass through Ealing, Brent, Hammersmith & Fulham, Kensington & Chelsea and Westminster in just under half an hour. 4: A walk down Worship Street, across Shoreditch High Street and into Folgate Street takes you from Islington to Hackney to the City to Tower Hamlets in just over five minutes. 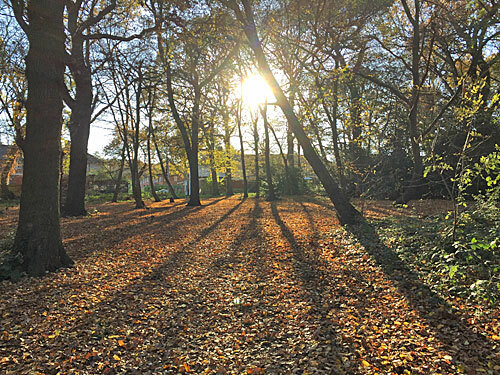 4: A ten minute walk from Wimbledon Common along the Beverley Brook, over the A3 and into Richmond Park takes you from Merton to Wandsworth to Kingston to Richmond. 4: A fifteen minute walk up the Olympic Park from Carpenters Road to Eton Manor takes you from Tower Hamlets through Newham and Hackney to Waltham Forest. 4: If the Thames froze over near the Oxo Tower you could walk from Southwark to Lambeth to the City to Westminster in about two minutes. 3: There are, I think, 50 places where three London boroughs meet. Section B: Answer one of the following essay questions in no more than 800 words. Q1) Assess the extent to which counter-urbanisation leads to social and economic change. Q2) Describe how obstacles, barriers and distance may influence the volume of internal migration. Q3) With reference to a case study you have researched, explain how a civic museum can be updated to survive in the era of austerity. Q4) ‘For local communities in areas of conflict, sustainability can create more problems than it solves.’ Discuss. 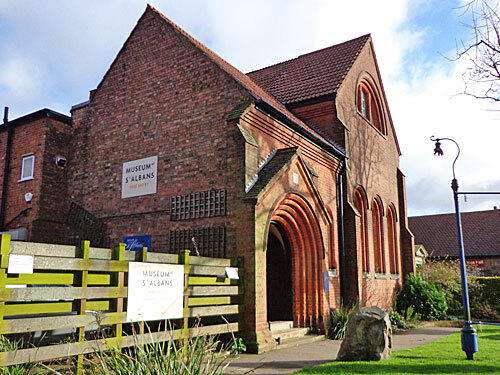 Q3) The Museum of St Albans used to be housed in a bespoke late Victorian building with draughty galleries across several levels. Not quite close enough to the city centre, it was easily overlooked by visitors heading to the more famous Abbey and Roman sites. I went once as a schoolchild and once as an adult. It didn't zing, but was properly packed out with local Hertfordshire stuff. Alas, survival was not assured. The city council duly closed the museum in 2015, and opened up a new museum this summer. 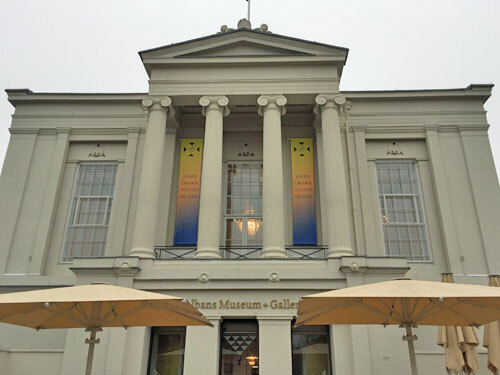 The St Albans Museum and Gallery is based in the old courthouse, part of the Georgian Town Hall, in a prime spot looking out over the Market Place. Basically you can't miss it, which is the perfect way to maximise footfall. Walk in through the front door and you find neither a museum nor a gallery. To the left is a rather large giftshop, and to the right a rather large cafe. Specifically it's the kitchen and servery, fronted by a long counter and details of the day's £7.95 lunch specials. The clever part is where you go to sit down, which is the old courtroom. Previously it was open to the public but empty and bereft, but now it's buzzing with ladies chatting over coffee, and therefore economically relevant. Sorry, did you miss the museum bit? 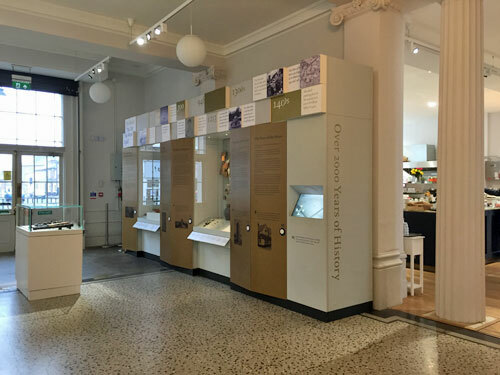 The city's 2000-year story is told across two display cases in the downstairs lobby, from Celtic settlement to commuter bolthole via Boudicca, Yorkists and the Ryder Cup. In case that's insufficient, the upstairs landing features a mere 15 items selected from the civic archives, including Jim Rodford's guitar, Eric Morecambe's pipe and Arthur the (stuffed) Lion. St Albans' Roman treasures are held in a separate building 20 minutes walk away, and well worth a look. But of the post-Roman ephemera once displayed proudly in bulk, there's pretty much nothing. Thankfully this is a Gallery as well as a Museum, and the greater amount of space has been given over to art. The first floor gallery is accessed via a scenic corridor, and the basement gallery isn't. I accidentally visited the day after one exhibition closed, and a week before the other opened, so saw none of it. Check your dates carefully. That said, opening next weekend is the splendid board games exhibition first shown at the V&A in Bethnal Green, and I've seen that, and it was splendid. In the cellar downstairs is an unexpected treat, the courtroom's cells. 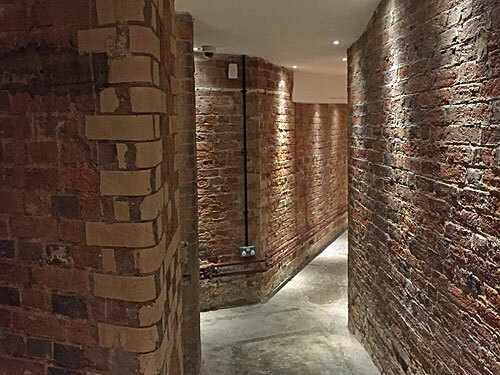 Around a wood-panelled corner you suddenly enter a maze of brick passages, some of whose doors open to reveal atmospherically lit chambers, and others of which have been converted into individual toilet facilities. 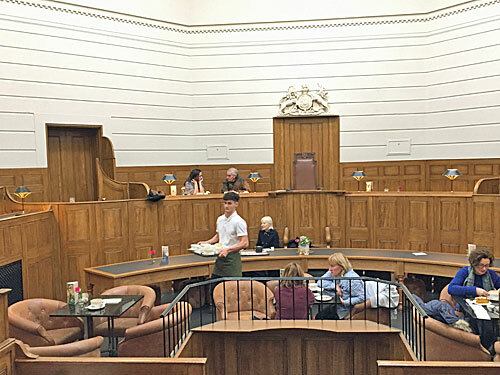 Track down the one that plays the historical video, and also the set of steps that emerges in the dock of the courtroom/tearoom above. Elsewhere don't miss the Assembly Room, a lavish high-ceilinged space in pride of place on the upper level, although all you'll find inside are a few activity tables for younger visitors. It'd make a fabulous setting for a wedding, conference or craft fair, thereby bringing in crucial revenue, which is why it has to be virtually empty all the rest of the time. In conclusion, to create a modern museum you grab a lottery grant and relocate to the centre of the city. You go big on the cafe but minimal on actual exhibits. You prioritise the gift shop. You bring in regular exhibitions to create repeat footfall. You close the previous Tourist Information Centre by putting some leaflets by the lifts. 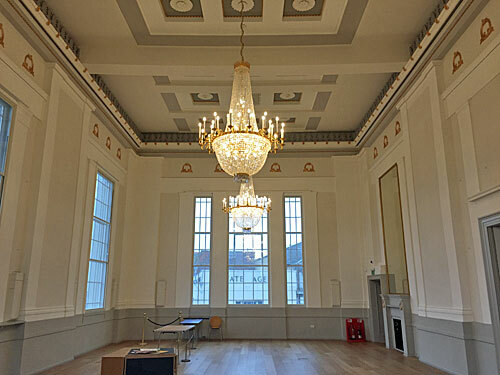 You ensure that one large historic room is available for hire. You encourage the general public to nip in and use the toilets. And it looks brilliant, and it's so well done, and shoppers like it, but it isn't a museum. B+ This is a competent response, detailing many of the intrinsic factors in the development of a new city museum, but is written in an over-familiar style, fails to use appropriate vocabulary and omits the key fact that the original museum was sold off for housing. A stronger answer would have outlined the decision-making process from a systems-based viewpoint, explored fiscal integration in greater depth and argued the case both for and against a heritage-led resource management scenario. Also the cakes are quite nice, and this is not referenced. Exactly ten years ago I wrote a post about rail fares. I researched the cheapest fares to ten stations approximately 50 miles from London, and ten stations approximately 100 miles from London. Ten years later, I thought I'd check out the same fares again. I started by finding the cost of an off-peak return ticket from London, travelling on a Saturday, turn up and go. n.b. I always picked the cheapest operator, for example travelling to Milton Keynes via the slow train rather than Virgin. Ten years ago the average off-peak fare to a station 50 miles from London was £18. All the fares I looked up were within £5 of that amount. This year the average is £22, and the range is much wider than it was before. Ten years ago the cheap destinations were Cambridge, Bedford, Milton Keynes and Brighton, and they still are. Each of these routes has some level of competition, rather than a single operator. Hastings and Arundel were the most expensive destinations, and they still are too. The largest fare increases are to the southwest, to Basingstoke and Arundel, where off-peak fares now cost almost 50% more. Increases to Colchester, Oxford and Ashford are nudging 40%. But Saturday fares to Cambridge, Brighton and Bedford have actually fallen, thanks to some exceptionally good super-off-peak deals on Greater Anglia and Thameslink. Ten years ago the average off-peak fare to a station 100 miles from London was £39. That's almost exactly double the average for 50 miles. This year the average off-peak fare is £50. Again the range is much wider than it was before. The most expensive destination has always been Loughborough, because East Midlands Trains fares are high. The cheapest fare used to be to Grantham, but East Coast fares have really shot up. The biggest price hike is to Worcester, a frightening 78%, which is the equivalent of an annual 6% increase. Fares to Birmingham are now the cheapest, so long as you travel via Chiltern. Fares to Lichfield have actually fallen by 20p, thanks to some competitive undercutting by new franchisee London Northwestern Railway. But overall it's not good news, as long distance weekend rail travel is becoming ever more expensive. Calais is also about 100 miles from London, but deserves a separate table because its fares aren't terribly representative. Ten years ago I managed to find weekend seats to France for £130, this year I could only manage £165. Read nothing into that 27% increase. But what if you're not travelling at the weekend? What if you have to travel at breakfast time? Which is why ten years ago I also researched weekday 'Anytime' fares. Ten years ago rocking up at breakfast time for a 100 mile rail trip would have set you back around £100. Ten years later it's more like £130. No wonder people don't rock up early very often. With a few exceptions, Anytime fares have risen by approximately 45%. That's generally higher than the equivalent off-peak increase. A return ticket to Loughborough, however, has shot up by a lot more. The biggest outliers, which have actually become cheaper over the last ten years, are both in the West Midlands - again courtesy of Chiltern and LNR. Anytime fares to Gloucester, Bath and Loughborough are extortionate, which may be because GWR and EMT have no competition. The contrast between Gloucester (£172) and Worcester (£84), 20 miles apart up the Severn Valley, is extraordinary. Meanwhile Bournemouth is particularly noteworthy for having an Anytime fare much lower than all the others. If you'd like to see an interactive map showing off-peak rail fares from London, hurrah, City Metric just published one. Fascinating stuff. More realistically for weekday travel, what about booking ahead? As I did ten years ago, I've searched for the cheapest Advance fare currently available for travel on the first Monday in December, departing around 8am and returning around 6pm. The best advance fare you can get is often pot luck, based on timing and availability. But I discovered an astonishing range of advance fares here, in general around £70 cheaper than turning up and buying a last minute ticket. The cheapest pre-booked journeys are to the West Midlands, it being possible to make a return trip to Birmingham or Lichfield for astonishingly little. I had to double check Birmingham because £13 is so low, but London Northwestern and Chiltern really do offer bargain basement seats even a week in advance. Norwich and Grantham have quite reasonable fares if you can book ahead. Pre-booking to Bournemouth saves nothing. Loughborough and Gloucester are still expensive destinations, despite having the largest pre-booked savings. Meanwhile the most extortionate 100-mile destination is Bath on GWR. I couldn't get the fare under £100, putting a day trip pretty much out of reach. And finally, for suburban commuters, what about travelling into London in the morning and back out in the evening? Here, at last, are some relatively coherent fares. Commuting 50 miles into London used to cost £30-45 a day ten years ago, and now costs £40-£60. Oxford and Hastings are at the expensive end of the range, and Cambridge, Bedford, Milton Keynes and Basingstoke at the other, but overall the range of fares is tighter than we've seen earlier. But fare increases over 10 years are on the high side, ranging around 30-50% and averaging out at 40%. With regulated fares rising annually above the rate of inflation, London commuters are being forced to pay relatively more. But it still seems that peak travel into London is priced more uniformly than travel out, suggesting that this is a better way to study basic underlying patterns. » Fares have gone up by about a third over the last 10 years, but not consistently. » On average fares are rising by 2-4% a year, ahead of the rate of inflation. » Thameslink, London Northwestern and Chiltern have some of the lowest fare increases. » EMT and GWR, who have no competition, have relatively expensive fares. » Rail travel in the UK is not priced by distance, it's much more nuanced than that. 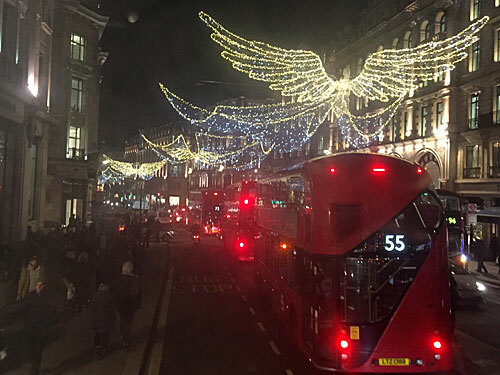 London's Christmas lights bring a little slice of magic to each festive season in the capital, and are best seen from the warmth and comfort of a bus. But which route best showcases the finest selection of London's Christmas lights? Why, route 23 of course, BUT ONLY IF YOU GO TONIGHT. For the finest festive lightshow in town, hop aboard the 23 at its very first stop, just round the corner from Westbourne Park tube station. Please note that you are only boarding at the first stop to make 100% certain of a top deck front row seat, otherwise you could get on board four miles later. Some Japanese tourists made this mistake on the bus I took and had to make do with taking part-obscured photos from the seat behind me, and they were silently livid. Enjoy the illuminated concrete grid of the Trellick Tower. Admire the neon blue arch across the Golborne Road railway bridge. See the dancing TV screens behind the windows of Kensal Road's council estates. Wow at the festive burger advert facing the big Sainsbury's by the canal. Gasp in admiration at the twinkly foliage across the front of Portobello House. Watch the headlamps on the Westway dance with silvery hues. All the traffic lights down Ladbroke Grove are blazing red or green. What an amazing illuminated journey it's been so far. Just to say, if for some reason you were planning to go to Hammersmith instead of Aldwych, you should have got off at Sainsbury's and hopped onto a number 295. What you definitely wouldn't do is carry on east to Marble Arch, alight and take another bus down the far side of Hyde Park, then catch a number 10 back west to Hammersmith, because that would be madness. Just saying. On Elgin Crescent the window of Evans Pharmacy is bedecked with dangly silver and blue lights. The Grocer boasts a giant glittery wreath. Daylesford on Westbourne Grove has placed illuminated Christmas trees outside on the pavement. BoConcept has a fully decorated tree in its window. At Electrical Wholesalers, the entire front of the shop brims with baubles, tinsel and strips of fairy lights. No other shops appear to have made a blind bit of effort, but the half hour spent aboard the bus so far has certainly had its highlights. 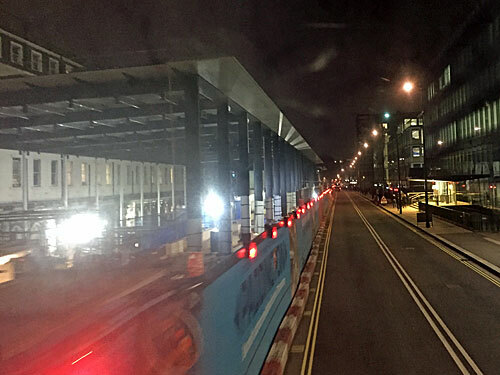 Paddington's massive Crossrail station is brightly lit, but still a mess of scaffolding and sheeting. It simply doesn't seem possible it could ever have been opening in two weeks time. On Praed Street, only the Aberdeen Steak House stands out with its bright shimmery window display. All the lampposts down the Edgware Road have been decorated with Christmas trees, so long as you think thin sparkly triangles with stellar infill look like Christmas trees. A fifteen minute traffic jam provides ample opportunity to admire the umpteen triangles. To be fair, sorry, it's been rubbish so far. Nobody in their right mind would ride the first four miles of route 23 to enjoy the Christmas lights. The only decent bit or route 23 is the three miles ahead between Marble Arch and Oxford Street. But YOU CAN ONLY RIDE THIS TONIGHT. Wow, Winter Wonderland is up and running in Hyde Park, its whirling wheels and funspikes now visible through the trees from Marble Arch. The big spectacle ahead is the collection of white and mauve globes which've been hung all the way down Oxford Street. We've seen them all before, of course, but from up here on the top deck they're just a fraction larger. Look, M&S has gone a bit purple. Some of the trees have been draped with lights. Selfridges has a series of tinsel-dressed windows with a rockstar theme. Quick, look at the feathers down Bond Street as we go by. The lights covering the front of House of Fraser are a shade creamier than those covering John Lewis. The radiant colours surrounding Oxford Circus are brighter than all those dull old globes put together. Travelling down Oxford Street took me ten minutes, which isn't fast, but could've been a lot worse. Most of the delay was waiting at the traffic lights, not getting stuck behind other buses. A lot of the upper decks were quite empty. A lot of the upper decks were quite full. Regent Street's angels are damned impressive. Their flashing fishnets light up the street with a kinetic dazzle. The Japanese tourists in the seat behind me have been forced to take a series of sub-optimal photos and are now mutely apoplectic. A chain of white snowflakes disappears off down New Burlington Street. Hamleys is Hamleys is Hamleys. The absolutely blinding adverts at Piccadilly Circus make no reference whatsoever to the fact that Christmas is coming. On the top deck of a 23 going the other way, a man has dangled his phone over the handrail to video the magnificent stream of angels as they unfold. A shoal of radiant white octopuses hovers above Coventry Street. Jermyn Street has distant angels. Trafalgar Square doesn't yet have its underwhelming Christmas tree. Now barely half a mile from home, the traffic ahead is appalling. Strand is a clogged queue, some of it buses, but most of it actually taxis. It takes a full twenty minutes to crawl to the end of the route at Aldwych, but at least this gives me longer to enjoy the glowing branded baubles of the Northbank Christmas lights. I cannot understand why everyone else got off and walked. Wow, what a lightshow it was. All hail the 23! So here's the catch. Tonight route 23 runs from Westbourne Park to Aldwych via the West End hotspots of Oxford Street, Regent Street and Trafalgar Square. Tomorrow it doesn't. Tomorrow it gets merged with route 10, which runs from King's Cross to Hammersmith. 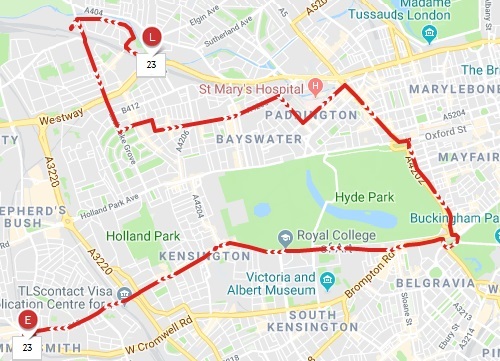 Tomorrow route 23 only gets as far as Marble Arch before diverting down the far side of Hyde Park, then heading back west to terminate at Hammersmith. Tomorrow route 23 becomes a route nobody would ever want to ride end to end, and route 10 is scrapped forever. This merger of routes 23 and 10 removes two bus routes from Oxford Street, so should have been brilliantly timed. Oxford Street was due to be pedestrianised in December 2018, so these buses were no longer needed. Crossrail was due to be opening in December 2018, so a rail alternative would be available instead. 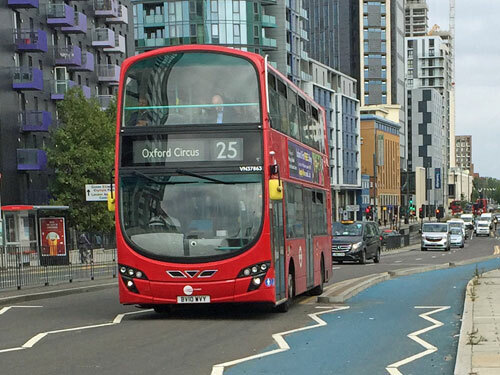 Alas the pedestrianisation of Oxford Street has been scrapped, and Crossrail has stalled, but the hybridisation of routes 23 and 10 is going ahead anyway, with route 23 becoming a twiddly bus which bends back on itself along an irrationally devious route. 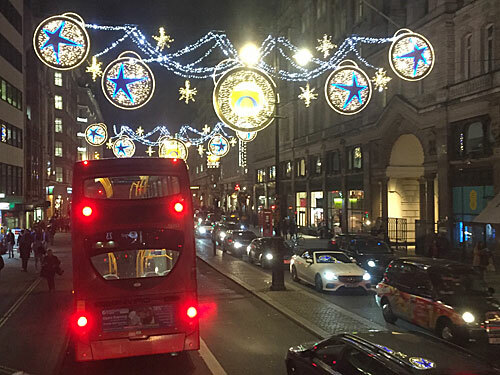 Which means today is the last day route 23 is The Best Bus Route For Seeing London's Christmas Lights. 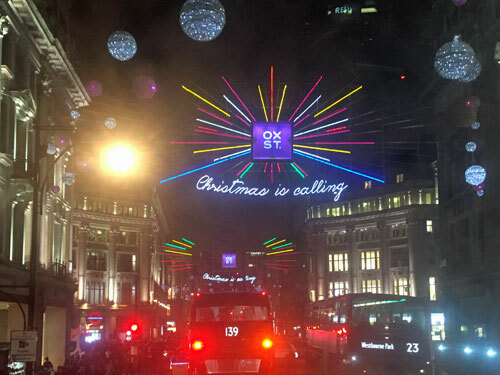 From tomorrow you'll have to take route 139 instead, which misses out on Marble Arch but still connects the lightshows on Oxford Street, Regent Street and the Strand. Or, if my early evening experience is anything to go by, forget that and just find yourself a bus that goes down Regent Street. The angels were great, but the other 90 minutes were a completely underwhelming waste of time. Life is a series of instabilities. We juggle them as best we can, but every so often something comes along which changes the way we live. Sometimes it's for the better, but sometimes not, and we have to readjust to a new version of personal reality which may not be what we'd hoped. Major instabilities include the loss of a job, the birth of a child, an unexpected diagnosis, the start (or end) of a relationship, a bad accident, a sudden windfall, a death in the family, that kind of thing. It doesn't even have to be a major instability to make a difference. There you are thinking your life's in balance, and something comes along which disrupts and unsettles everything. I reckon there's a sequence to it. Awareness is the moment something shows up, but you don't yet recognise it for what it is. It might be a child's cry, or a twinge in your chest, or your partner staying out for the night, or the sound of the phone ringing. When I lost my job, it was the moment an email pinged into by inbox inviting me to 'a meeting'. Suspicion is the first dawning realisation that something might be up. It might be spotting you've had a lot of headaches lately, or noticing your birth date amongst the lottery numbers, or a lorry suddenly turning left, or wondering why your grandmother didn't ring this morning. When I lost my job, it was five minutes after the email arrived, when I suddenly thought "oh, this might not be good". Confirmation is when a forthcoming change is verified. It might be the time a doctor sits you down and tells you something, or the split second after you fall off a ladder, or a positive pregnancy test, or reading the letter inside a brown envelope sent in the post. When I lost my job, it was the Powerpoint slide revealing what 'the meeting' was really about. Definition is when ultimate ramifications are made clear. It might be being told the arthritis will make mobility difficult within three years, or having a pay rise confirmed, or being offered an engagement ring, or learning that the meteor will hit next Tuesday. When I lost my job, it was the meeting in which terms and conditions were settled along with a termination date. Sometimes 'what' and 'when' are confirmed separately. Execution is the point at which the instability actually happens. It might be the first day at a new school, or the day your children leave home, or your first pair of bifocals, or the judge passing sentence. It might be the moment you give birth, or the moment you drop dead. When I lost my job, it was the moment I walked out the door and never came back. 2 Was that a smile? Things can move slow or fast. The onset of a chronic disease can take years. An eviction notice might give you two months to get out. In a car accident you might go from stage 1 to stage 5 in a matter of seconds, if you even notice at all. Sometimes having longer to adapt to the instability can be invaluable. Sometimes it only gives you longer to worry. Importantly, sometimes the later stages never happen. You suspect something's wrong, but it isn't. Bad news is announced, but never followed through. You fear the worst, but it's not that bad. Sometimes things stabilise, or something else happens which entirely dwarfs it, or the whole problem goes away. But other times, sorry, there is no escape. And I mention all this because I'm currently at stage 3. Stage 1 was last month, and looked perfectly normal. Stage 2 was a couple of weeks ago, but I didn't act on it until Monday. Stage 3 was yesterday - uncannily less than an hour after I'd been making a cup of tea and reflecting on how stable my life was. Stage 4 might be later this month, or next year, or even 2023. And I'm not concerning myself with stage 5 until stage 4's happened, because there's no need to destabilise my life until absolutely necessary. Life is a series of instabilities. We all readjust as best as we can. Imagine if TfL sold a special ticket to tourists which cost the same as a Travelcard, but offered less. And then imagine if they promoted it excitedly, despite it being worse value for money. The Visitor Pass is that bad deal. When Londoners swan around the capital for the day they use Pay As You Go. Daily capping means you can travel anywhere in zones 1 to 6 for £12.50, no matter how many tubes you ride, buses you board or trains you take. All you need is Oyster or contactless and £12.50 is the most you'll pay. Less confident visitors buy a Travelcard. TfL have tried to phase them out, but the Z1-6 Travelcard remains because it's a piece of cardboard everybody understands. With this magic rectangle you can go anywhere without messing up if you fail to touch out, or worrying about topping up, or any of the other potential digital confusions. But the price of staying analogue is that it'll cost you more, £12.70 rather than £12.50, and you can't use it before 9.30am on weekdays. n.b. There is an all day version of the Z1-6 Travelcard, but this costs £18.10. That's extortionate, especially given that Pay As You Go folk pay £5.60 less for all day travel. But for the purposes of comparison let's stick with the post-9.30am off-peak version. Now TfL have come up with a new magic rectangle, the Visitor Pass. Whether it's your first time visiting London, or you've been before, our new Visitor Pass gives you the freedom to travel as much as you want on bus, Tube, tram, DLR, London Overground and TfL Rail. Why buy a Visitor Pass? So, how much does this 'bargain' cost? A 2-day Visitor Pass costs £25.40. A 3-day Visitor Pass costs £38.10. I don't know how good your 127 times table is, but these are exact multiples of £12.70. A 2-day Visitor Pass costs exactly the same as two off-peak Z1-6 Travelcards. A 3-day Visitor Pass costs exactly the same as three off-peak Z1-6 Travelcards. Essentially the Visitor Pass is a multi-day Travelcard... but, crucially, it offers less. Like a Travelcard, a Visitor Pass "gives you the freedom to travel as much as you want on bus, Tube, tram, DLR, London Overground and TfL Rail". But it doesn't let you travel on National Rail services, only on services run by TfL, so a significant proportion of London's railway network is unavailable. Train to Hampton Court? No. A quick trip to Croydon? Sorry. Useful Thameslink shortcut from Blackfriars to Farringdon? No chance. Also, a Visitor Pass doesn't allow you a one-third discount on river services, like a Travelcard does, nor a £1 discount on the cablecar. By buying a Visitor Pass, you are allowing TfL to charge you more on modes of transport you as a visitor are most likely to use. n.b. As for the supposed bonus of being able to use TfL Rail from Heathrow, that's nothing special. A Z1-6 Travelcard already includes travel on the Heathrow Crossrail spur, and anyone using Pay As You Go simply gets bumped up to the maximum £12.50 cap. There's got to be a perk somewhere, and that perk is convenience. Oyster requires topping up, and a refund on your excess balance afterwards. Travelcards need to be bought daily. But a Visitor Pass allows you to stand in a queue once, then never have to worry about topping-up again for the next three days. I get why they'd be popular. When I'm in a foreign capital using an unfamiliar metro, what I want is something simple that covers my travel while I'm there. I don't want to risk touching in wrongly and being fined, à la Oyster, or accidentally travelling beyond my eligibility, or the hassle of having to buy a brand new ticket tomorrow. I want a one-purchase travel solution, and that's what the Visitor Pass provides, at a price. But visitor tickets are only worthwhile if you know you'll use them several times, every day, otherwise you're spending money on travel you're not making. They're also only good value if you're heading into the deep suburbs, which most tourists aren't. For example, a Z1-4 Travelcard also costs £12.70 but is a better deal because it can be used before 9.30am. As for tourists who stay solely within zones 1 and 2, here the daily cap is only £6.80 - close to half the the cost of a Visitor Pass. 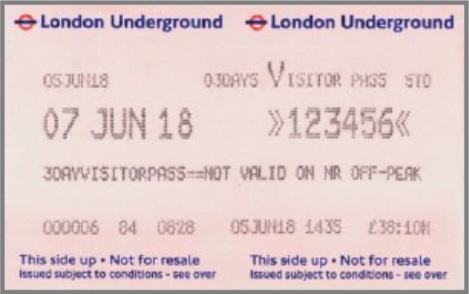 It's worth noting that TfL weren't initially 100% convinced the Visitor Pass was necessary. They launched a small trial in June, at certain stations only, to gauge demand. By October over ten thousand tickets had been sold, with Heathrow, Victoria, Paddington, Liverpool Street and King's Cross the stations with by far the biggest sales. The trial continues until January, when a decision will be made as to whether the Visitor Pass will be withdrawn, made permanent or extended. But the fact that TfL have now started tweeting about it suggests it's going well. One possible reason for the Visitor Pass's retention is that it's restricted to TfL services only, so TfL pocket 100% of the revenue. It's also true that TfL didn't want to introduce a paper product London residents might find cost-effective, not when shifting everyone onto contactless is the priority. But it seems odd deliberately promoting a substandard product when better options exist, simply because so many tourists don't understand London's complicated fare systems in the first place. The Green Chain is a network of footpaths threading through southeast London linking woods and open spaces. It's one of the capital's key strategic walking routes. It's less well known than the Capital Ring or Thames Path, but much better signposted. Four of its eleven sections match the start of the Capital Ring, and another two provide alternative diversionary routes. For today's jaunt I chose one of those diversions - indeed the only section I've never walked before. Section 9 of the Green Chain begins nowhere special, on a bend in a suburban street an annoying distance away from Mottingham station. Houses are broadly semi-detached. Rajni has lost a two-year-old black tabby cat called Gerry. Someone walks past balancing three M&S ready meals from the BP garage round the corner. 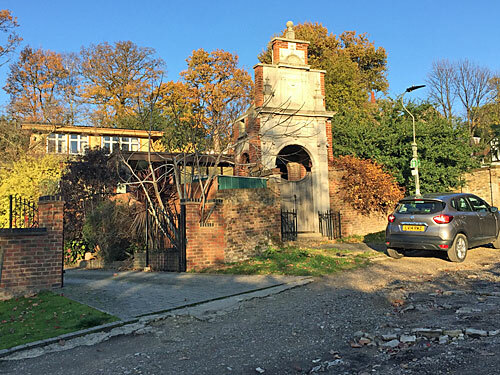 Just behind the fence is an art gallery, a recent addition to the educational estate of independent Eltham College, whose sports grounds stretch half a mile down towards the Quaggy. 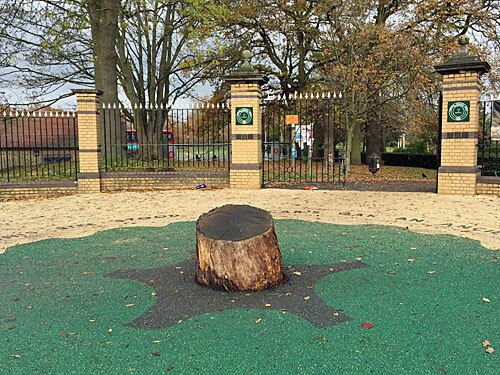 The Green Chain heads round to the front gates, then makes a break for a much more ordinary recreation ground. Mottingham Sports Ground comprises a dozen football pitches, each marked by a pair of netless goalposts, plus a drab pavilion by the car park. Once a week this is a hubbub of kickabout activity, but now only the last few players remain in conversation, muddy kits spilling out of kitbags. A squad of crows are in formation across one of the penalty areas. At the top of the slope is a tiny brook, and beyond that Lower Marvels Wood, a delightful patch of scrunchy-leaved woodland protected by motorbike-proof gates. One particular tree is being defended by a team of agitated squirrels, desperately battling off a ground-up assault from a bushy-tailed attack force. Crossing a couple of residential streets brings us to Marvels Wood - technically Upper but not described as such. Again autumn is in full flow, stripped oaks rising high above a carpet of crackly brown, with chunks of trunk scattered here and there for added interest. A short circuit round the wood is marked as a Wild Walkabout, ideal for those with wheelchairs, pushchairs and others with limited mobility, although it looks no different from other tracks. Squirrel numbers are again high. Ahead the trees merge imperceptibly into Elmstead Woods, which looks glorious, but instead the Green Chain slinks off to one side to follow the boundary of Grove Park Cemetery. Part-way down the railinged descent comes a part-explanation. This section of the Green Chain has three arms, and a signpost here is the point where the two kilometre branch from Chislehurst connects. I couldn't resist a walk up the hill into the heart of the oak forest, just far enough to enjoy its superior leafy vibe before retracing my steps. I might have walked further, but the middle-aged couple taking photos of each other looked like they wanted me out of the way as quickly as possible. Instead I returned to the cemetery's edge, beyond whose railings numerous relatives were tending lines of graves, removing dead flowers and adding fresh. 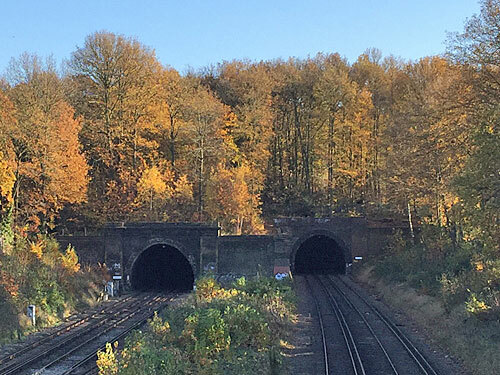 All too soon woodland is cut short by railway, as the line to Orpington plunges into a pair of tunnels. The station on the other side of the hill is Elmstead Woods, but we're heading the other way, along an evergreen path already bedecked for winter. Another spur of another Green Chain section connects here, but that's for completists only. Someone has attached free plastic bags and a message from the Poo Fairy at each end of the footbridge, perhaps too patronising in tone to hit home with its intended target audience. A staffie waddles by, closely followed by two men dressed in grey trackies. Thus far the Green Chain has done well linking sequential green spaces, but here it comes up against a golf course and loses. 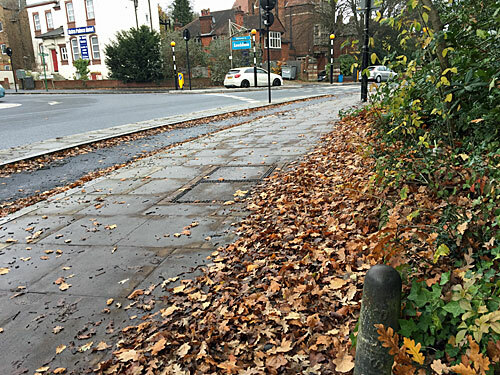 The next three quarters of a mile is spent skirting Sundridge Park, whose links and greens are carefully screened from prying eyes by a line of trees planted many years ago with intent. Initially this means descending New Street Hill, the non-golf side of the street an attractive line of 1940s houses. It dips, then rises, a telltale indicator that the headwaters of the River Quaggy flow unseen at the bottom of the valley. And then it means following a narrow path squished between the golf course and some allotments, for a few minutes longer than feels enjoyable. Thus far the Green Chain has been exceptionally well signposted, so much so that I could have left my directions at home. But then comes a post with its top burnt to charcoal (go straight ahead), then a sign nudged the wrong way (bend sharp right), and then another deliberately twisted round (do not enter the recreation ground). The railway line crossed here is the dinky spur to Bromley North, with Sundridge Park station located very close to the south. 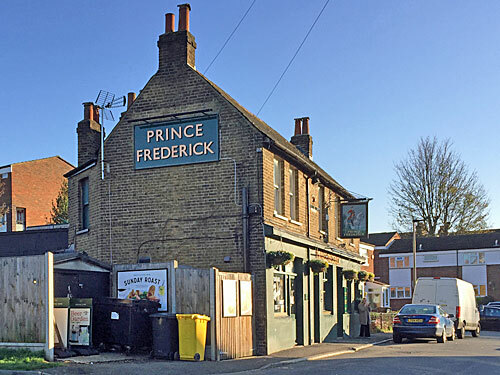 A Greene King rebrand means the Prince Frederick looks nothing special, but it's actually Victorian on the site of an 18th century inn, long before Sunday roasts and BT Sport. What they don't warn you about in the Green Chain blurb is that'll you'll end up walking a mile along suburban Bromley streets. Specifically this is Plaistow, a swallowed hamlet not to be confused with the East London district of the same name (and here more normally pronounced 'play-' than 'plah-'). Park Avenue seems to go on for ages, and is comfortably ordinary, whereas Elstree Hill is somewhat wild. An uneven pebbly descent, this private road twists down past a motley assortment of detached dwellings, some accessible only by steep steps. One otherwise plain house boasts the former doorway to the London School Board offices as its ornate porch. Deep gullies and potholes remind the rest of us why we pay tax. That's Millwall FC's training ground on the valley floor. Its pitches are pristine, but its blue-topped clubhouse will win no architectural prizes. 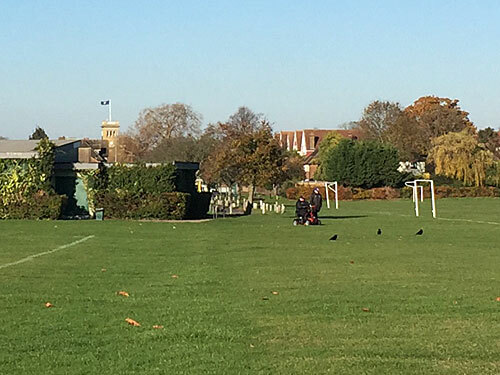 An adjacent recreation ground is provided for non-professional locals. Beyond the river Ravensbourne is an unstaffed station of the same name, which would be a sensible place to stop, but section 9 dribbles on into Beckenham Place Park to link up with sections 8 and 10. This is by far the busiest part of my walk, a magnet for Beckenham-folk seeking an autumn amble with their offspring, partners and hounds. One family has brought a pramful of props to help them snap woodland portraits of their small daughter. Another has brought Casper, Lewisham's most disobedient King Charles spaniel. I have walked from Mottingham, and I may be alone in that.